The owners of this property told me they moved this plaque into their back yard, enclosed with a fence, and the citizens of Wellsville demanded their memorial returned, which was done, of course. "Here James A. Garfield, Abraham Lincoln, and Andrew Johnson spoke, General Lewis Cass, U.S. Secretary Of State was a guest, and General John H. Morgan, CSA "The Raider" was a prisoner of war." And I am stunned! I never heard of this place. 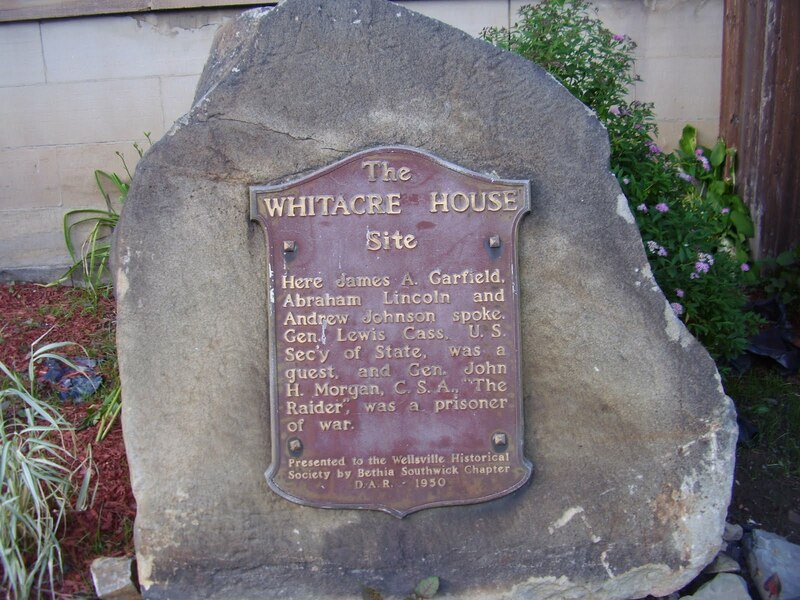 The Whitacre House burned down around the 1920's , though I can't remember for sure. 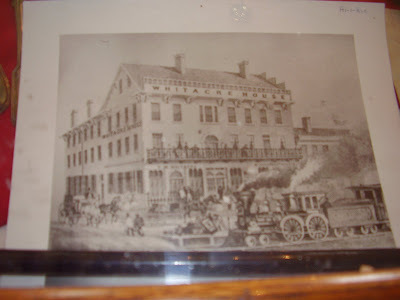 This picture can be found in the River Museum in Wellsville. The two names that jumped out at me on the plaque was Abraham Lincoln (of course!) and then Gen. John H. Morgan. Yet another part of the Morgans Raiders story unfolded for me Once he was captured near West Point, he was taken to Wellsville until he could be transported safely to Columbus. I was overjoyed to discover even more major historical events that occurred in Columbiana County. What a treasure trove this little county is turning out to be! 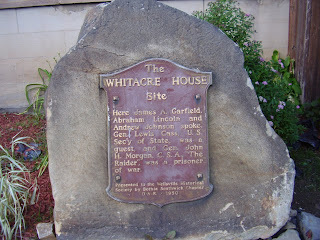 Tomorrow I will tell you about the building that now sits on the Whitacre House site. Rumors about it include one involving Pretty Boy Floyd. Lincoln stopped for a speech enroute to his first inauguration. Morgan & his men were held prisoner there until he could be transfer to the State prison in Columbus. After escaping from there he was killed a short time after that in Kentucky. His sword was given to the Whitacre House owners's son in thanks for bringing Morgan and his men water to quench their thirst. The sword was donated to the museum by the lad's daughter, Francis Whitacre Morton. Mortan was a long time Columbiana County recorder who lived in Wellsville. Thanks Ole Nib! The information is greatly appreciated!